Once you have completed your course modules, assignments and personal final exam with your private mentor, you will be awarded your diploma, sent directly from the AOFM headquarters in London. We are very proud of our exemplary training standards and you can have peace of mind you will experience the same high quality as an online student as our campus-based students. Therefore, unlike other online schools, we don't believe in students self-printing such an important and life-changing document. Your International Diploma in Freelance Makeup Artistry is accredited by the London Academy of Freelance Make Up, personally signed by our Global Head of Education and hand-delivered to your home within a matter of days of course completion. AOFM is proud to offer our online makeup course students an additional two complimentary qualification certificates taught by two of the worlds most celebrated makeup artists. 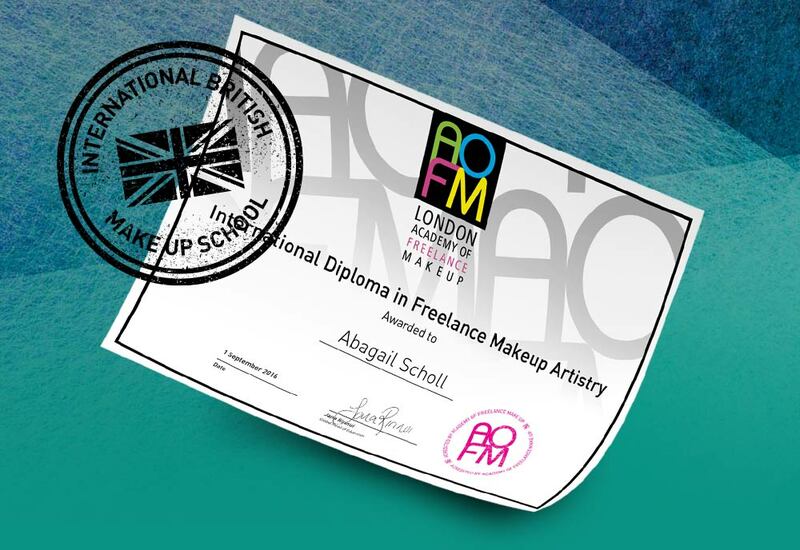 Students have the choice to take these two extra certificates whilst studying their international freelance makeup diploma or chose to move forward and not take these two extra modules. All you need to do is let your personal mentor know if you would like to add them to your syllabus. You will be awarded 2 extra bonus certificates and qualifications on top of your international freelance makeup artistry diploma. Please note that students are responsible for purchasing all equipment for these 2 extra courses. The AOFM Online Makeup School is a revolutionary new programme like no other! We have created a step-by-step video sequence that will cover every aspect to becoming a successful makeup artist. The Online Makeup Course comprises of 17 modules, teaching you everything from product knowledge, skincare, techniques for applying foundation, eyes, lips as well as taking you through the journey of a professional editorial shoot. Click to view the full syllabus here. As an added bonus you will receive an EXCLUSIVE BACKSTAGE PASS where you will be taken behind the scenes with our online makeup artists as they travel the globe working with international clients. We will take you backstage at Fashion Weeks in London, Paris, New York, Milan, Moscow, Berlin and Tokyo - something that no other online makeup school has access to. To continue your online education you also have the chance to take part in masterclasses with some of the industry's leading cosmetic brands and internationally renowned makeup artists as well as following our makeup artists as they work on editorial shoots in London and Paris. Your course will begin as soon as you enrol, you are given 12 months to complete your course & can work at your own pace with the guidance of your personal mentor. Throughout the duration of your course you will be required to work on a model, a friend or family member will be perfect for this. The fee of this course is payable in full upon enrollment, AOFM Online does not currently offer any monthly payment plans or accept government funding. Learn from more than 50 of the world’s leading makeup artists and industry's elite. We offer more than 250+ condensed educational videos taught to you by industry leading makeup artists from all over the world. Learning from an academy industry renowned who are would famous with over 10 years of in house education international courses centers. Private backstage access straight from the Fashion Week’s of London, Paris, New York, Milan, Berlin, Moscow and Tokyo. A inclusive hand delivered AOFM makeup kit featuring a MAC Cosmetics and much, more with a value of over £850. An assigned personal and private mentor who will be on-call to help you through every step of your course. A private invitation to the head offices and stores of the world leading cosmetic brands through our revolutionary Private shopper page. A 350+ page AOFM training manual of course notes featuring industry tip and tricks. Discounts on hundreds of brands featuring thousands of products including a MAC Pro student discount card. Live one-to-one video contact and exams with your personal mentor throughout your training. The opportunity of joining our backstage Pro team and traveling the world with us. And that's not all, we will also sponsor 2 students once per year to receive an all expenses trip to ether London, New York or Milan to work with us backstage, no matter where you are in world! A diploma certified by our London makeup academy and signed personally our global head of education and delivered to your door. AOFM has designed a revolutionary, state-of-the-art personalised PRO-FILE system for our online students. Once you enrol in our programme you will be able to upload and create your own personal file, then we will connect you directly with your very own private mentor who will guide you through every step of your course. Not only that, but you will be able to upload, check past work and see your results through our specially designed progress graph. You will be able to liaise with your personal mentor and work towards unlocking special extra free rewards which will become available to you as you progress through your training. The one feature that sets AOFM ONLINE makeup school apart from other online programmes is that we offer the huge training advantage of live one-on-one video chats with your private mentor throughout your training. What could be better than that?! As a student of AOFM Online you will graduate with a personal conference call with your personal mentor who will talk to you about your strengths, weaknesses and ways you can improve. You will also receive a live answer regarding your pass, followed by a signed certificate from our London head office. Swipe left or right to view more. AOFM Online makeup school is like no other with key factors that make us stand apart from the rest. Our makeup academies have been established for over 10 years so students know they are benefiting from our vast amount of industry expertise, knowledge and contacts. WIth over 35 hours of tutorial training, taught by 50 top international makeup artists, you can sit back and enjoy learning from the world's makeup elite. We don't believe in only learning from one person when there are some many techniques, tips and tricks to learn so we only source the best tutors in the business. We have created the first ever private shopper experience where we take you on a private tour of some of the world's top makeup bands both in stores and even their head offices. Let AOFM take you on a personal journey through some of the world's top brands all from the comfort of your own home. AOFM's revolutionary personal PRO-FILE dashboard gives you your very own personal and private mentor to guide you through every step. 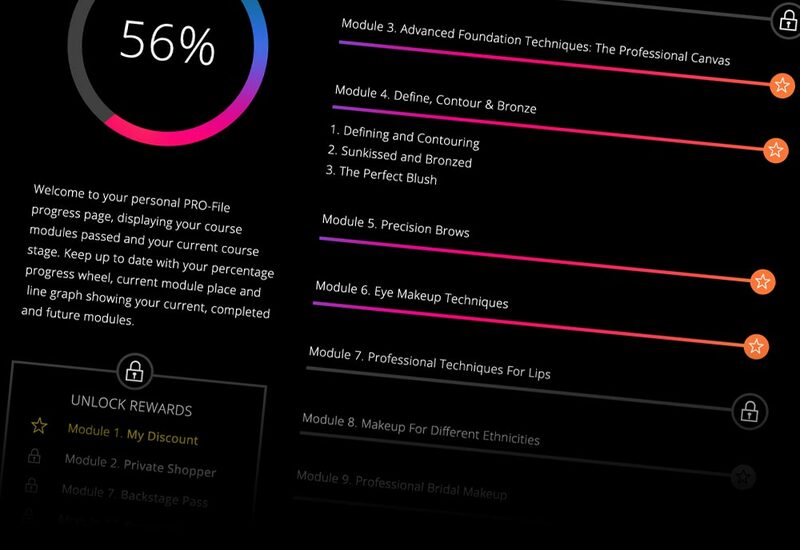 It also allows you to upload your assignments to send to your mentor for review, and gives you face-to-face video contact with them during your training - a world-first for an online makeup school! An Industry first. AOFM takes you backstage to learn step by step makeup on more then a100 shows from the world's biggest designer.. AOFM is the the ONLY school to head shows at London, Paris, New York and Milan Fashion Weeks every year. Watch step by step as our famous AOFM Pro teams and graduates on the job. You could be joining us backstage through our famous aftercare and support care. A select few students will be asked to join our Pro Team at Fashion Weeks in London, Paris, New York, Milan, Moscow, Tokyo and Berlin. We believe not only in educating but helping you to forge a career for yourself in this amazing industry. Take a first-ever journey through fashion weeks, beauty and Fashion editorial. Our documentary-style videos as we take you from start to finish on the job. Learn from fashion designers, makeup artists, hair stylists, clothes stylists and more so you fully understand the entire process. You will be a "fly on the wall" for the day. Certificate in Professional Airbrush Makeup With Temptu. Learn from top celebrity makeup artist and Temptu educator for Dani Fonseca. Among many other celebrities works with Dani Fonseca is the make up artist appointed by Lady Gagas born this way video, there really is no one better to teach you everything you need to know about becoming a professional airbrush makeup artist. She will teach you the A-Z of using Temptu airbrush equipment, Her tips & tricks of the trade and even take you on journey step by step on how she created Lady Gaga's 'Born This Way' skeleton look. 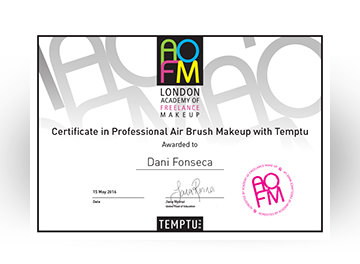 This certificate comes from the Academy of Freelance Makeup in London and is also certified by Temptu. Taught by the world's most famous body painter, Caroline Roper. Holding the worlds number one body painter designer title of first place for 3 years awarded by the world body painting federation, Roper is at the top of her game. Our students are incredibly lucky to get this amazing body painter to each them all they need to know in becoming a professional body painter. Caroline will guide you though all the steps of applying body paint this will include kit essentials, all of the application techniques you could ever need and of course her top secret tips and tricks. What is an online makeup school? An online course is just another form of education with all the perks of being in a classroom but done remotely. It's suitable for those who just can’t commit to travelling to a studio or an education center. We have designed our online course so you feel that you are learning in a one-to-one environment with your mentor. You have the ability to communicate all your questions to your personal mentor and also get the experience of being backstage at major industry events. This online course is unique in its way of making you feel like you have done it in a studio and not from the comfort of your own home. Is is possible to learn effectively online? Absolutely! Learning how to apply makeup online is all about watching and learning but most importantly practicing. It is also about understanding the tools and products that are required to achieve specific looks. You will be learning how to create these looks from some of the best artists in the industry in a step-by-step format. The best way to ensure that you are learning the techniques taught to you whilst learning is to practice as much as possible on your model, a friend or family member will be needed for each module. What is different about AOFM's online makeup school? We have created an online course that is more interactive than any other course available. Our tutorial videos are easy to watch with an in depth step-by-step process, displaying all the tips, techniques, products and tools used. No other education institute can give you this amount of extra footage to watch and learn from. We have over 100 videos of the AOFM team working backstage at Fashion Weeks in New York, London, Paris, Milan, Berlin, Moscow and Tokyo. AOFM will also bring you along on a journey through editorial shoots in Paris and London. There is really no other online school that offers what we have available to you, all from the comfort of your own home. This is the bitter truth, there are no qualifications required to becoming a makeup artist. It is all about your skill, the way you network yourself, build contacts and relationships in the industry. AOFM is here to give you all the necessary skills and insider knowledge about the industry but it is all up to you once you complete the course. Once your application has been approved by a member of our team you will be able to log in, set up your profile & being your journey into the world of professional makeup artistry! It is completely up to you! Once you enrol on the course, you are given 12 months to complete it, during that time it is down to you how often you study and submit your work, there are hours and hours of footage to view with the AOFM Online school. Throughout the duration of the course you will have to complete the videos in a pre-arranged order. After each module you are responsible to complete your online assessment with your mentor. Once your assessment has been critiqued and you have passed, you will then gain access to the next module of videos. Throughout the series of online tutorial videos, you will also be rewarded access to AOFM’s FREE rewards, which include Your Private Shopper, Your Backstage Pass and Your Private Masterclass. Once graduated, you are given a further 12 months of access to our aftercare programe, there is definitely no shortage of educational videos so it all depends on the time you have to watch and learn! The course fee includes access to 17 sections containing all of the tutorial videos that guide you to becoming a professional makeup artist. Along with the educational tutorial videos you will gain access to a number of exclusive AOFM Masterclasses led by some of the industry's elite talent and influential leaders. AOFM is also the only online school to offer a Backstage Pass to over 100 shows for London, New York, Milan, Paris, Berlin, Moscow, and Tokyo fashion weeks! Here you will see step-by-steps for the looks created and have the opportunity to re-create them in the comfort of your own home. We will also take you on a Private Shopping journey to some of the best cosmetic brands, giving you insider knowledge about leading products, this will guide you when building your makeup kit. Included in the course fee you will also receive a 21-piece starter kit from MAC Cosmetics along with a 24 piece AOFM pro Tool Collection Brush set, a 6-piece Dermalogica skincare kit a set of Barbara Carranza professional tweezers, 3 clear makeup storage bags, the book Makeup Is Art for creative reference and AOFM Face Charts for you to document your work, this all comes in the famous AOFM glossy black box and is delivered to your door. How will I receive my kit and is everything I need included in it? After you have joined AOFM online, your kit will be delivered to your door, we use DHL for all of our shipments. Your kit has been expertly pieced together so we can give you the products you’ll need to begin your education however there will be products recommended to you throughout that you will might like to buy. The products included in the kit are entirely subject to availability, if for any reason an included product is unavailable, it will be substituted without notice. The home of AOFM is in the creative heart of central London, Soho. We also provide studio-based training in New York, Paris & Belfast. This, along with our global travels to the fashion capitals of the world for Fashion Week and other industry events, means we have unrivalled experience of the makeup industry across the globe resulting in AOFM being the leading makeup school. What kind of Aftercare and Support do I receive after I have completed the course? As an online graduate you will receive unlimited access to Your Private Shopper, Your Private Masterclass and Your Backstage Pass for a year. AOFM will be updating this continually so you will be up to date at all times with what’s going on in the fashion industry. Also, AOFM will be sponsoring 2 online graduates per year to join us backstage at fashion week in either London or New York. Will I receive a certificate after completing the online course? Yes, once you have completed your online course, passed your qualifying one-to-one examination and have received your feedback from your personal mentor, you will receive a certificate sent to you from our academy in London. Do you offer any payment plan schemes? We do not have a payment plan scheme in place for our online course, the cost is a fixed price to be payable upon enrolling on the course. What separates AOFM Online from tutorials that I can find on YouTube? AOFM’s teachers are industry leading freelance makeup artists who collectively specialize in every area of the industry, this alongside the unique format of learning with your personal mentor that can answer any questions you may have will ensure that you get an optimised learning experience that is tailored to your own learning requirements. It is through 10 years of campus based education that AOFM can confidently bridge the gap between a classroom learning experience and learning from the comfort of your own home as you work towards receiving certification as a qualified professional freelance makeup artist. Whilst YouTube tutorials can offer you one person’s opinions on technique or product preference, we give you a well-rounded unbiased education that will ensure that you know everything you need to know when embarking on your new career as a professional makeup artistry. What is your association with MAC Cosmetics? MAC Cosmetics is a world leading professional makeup brand that is used by the top freelance makeup artists all over the world. MAC work with schools who qualify for their support making sure that the schools meet their criteria. Here at AOFM, we are proud to work closely with MAC and we are honored to offer our students amazing products to start their journey in professional makeup artistry, but that's not all! We are also proud to offer our students in the USA and Canada a MAC Pro student discount. As soon as you sign up to AOFM online you will be eligible to apply for your MAC pro student discount card. Taking advantage of an amazing discount and the MAC pro community. We are the ONLY online makeup school to offer this to our students. If you’re not based in the USA or Canada, don't worry, your will be able to apply for Mac pro discount card after completing your course with us and are working as a freelance makeup artist. You'll find AOFM on the MAC pro website under eligible schools. Once you start your course you'll be able to register for your discount card* and on your way to building your professional makeup kit. *For residents of the United Kingdom, North America & Canada. As well as our unique relationship with MAC cosmetics, we offer our students access to a database of brands from all four corners of the world, this includes iconic brands such as Giorgio Armani, Smashbox, Bobbi Brown, Inglot etc. as well as up a coming brands & also professional makeup supplies stores that can offer student and professional discounts on thousands of products from hundreds of brands. Now that I have trained, how do I become a successful makeup artist and start making money? Training, assisting, testing and lots of practice are all key to becoming a successful makeup artist. However, commitment, dedication, networking and building contacts in the industry are also essential elements to ensure you have a good chance of doing really well. It's known to be a tough industry to crack, but once you get your foot in the door then you will be flying. And here at AOFM we aim to give you that foot through the door. Some makeup artists may already have industry contacts, which will help them to get ahead quite quickly while others will have to knock on a lot of doors to be given opportunities, if you are willing to put in the legwork it usually pays off. You will need to start building your makeup kit to a professional level. Think of it as an investment that you can work on building-up slowly. It is important when starting out not to buy the most expensive materials until you really need them. Spend your money on the products that truly require quality - like skincare, foundations, concealers and eyeshadows. As for lipsticks, lip glosses, eye pencils and lip pencils it is better to go for cheaper versions to start with. Most cosmetic brands in the industry will offer working makeup artists a professional discount on their products, you can use our extensive database of these brands to find which of them you can use to optimise your kit. Make strong connections with photographers, stylists and hairstylists who are also starting out in the industry. Build a team that you can trust and test with regularly to help build your portfolio. Assisting is one of the best ways to kick start your career, If you work alongside an artist who is already successful and works regularly in the industry, this will give you the experience and knowledge about how to be professional on set. You will also be able to pick up any tips and techniques from the makeup artist you are assisting. It is very important for you to understand that most assisting positions are unpaid. It is also important for you to learn and develop new skills, build up your speed and confidence, consider it as free training!